Lifeguards came to the rescue when a 10-year-old boy was attacked by a shark while wading in waist-deep water. The boy who was swimming in the shallows at a beach in Florida suffered a severe bite to his calf. Fellow beach-goers saw him struggling in the waves and alerted lifeguards. 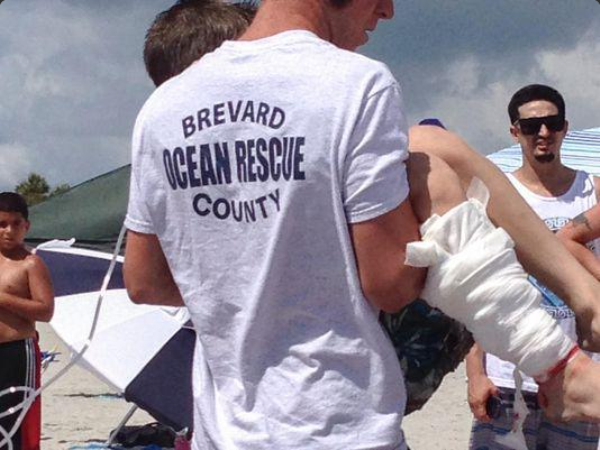 "He was in waist deep waters near his mother and our lifeguards saw him in distress… It's severe. We wrapped it up as fast as we could," said Ocean Rescue Assistant Chief Eisen Witcher. The shark is believed to be a juvenile bull shark which explains why it was preying on victims in the shallows. According to Florida’s Museum of Natural History, "Bull sharks inhabit quite shallow waters, which means that they do have a great opportunity to interact with humans, because the two species tend to share the same areas." The boy was airlifted to a hospital in nearby Orlando following the attack and is in a stable condition.